Super Undies Pull-On Trainers pull up and down just like real underwear! Super Undies Pull-One Trainers 2.0 - Now With a Trimmer Fit! 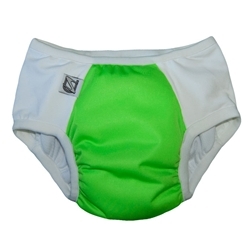 Super Undies are designed to help parents and kids with potty training. Stretchy side panels help Super Undies Pull-On Trainer spulls up and down with ease, just like big kid underwear! Pulling underpants up and down on their own instills confidence in your little one--something that is very important as they are learning to pay attention to their body during potty training. This trainer includes a single layer of microfiber, making it a perfect trickle trainer. 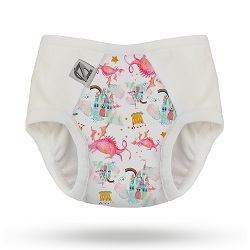 Some tots need extra absorbency during the early stages of potty training, which is why Super Undies designed these trainers with a pass-through pocket. This pocket allows mom or dad to easily add absorbency, like a Super Undies Step Up Insert, for heavier wetters or those still learning to control their bladder at nap time. Super Undies are designed so your child feels wet, allowing them to learn the natural consequence of an accident and encouraging them to use the potty. Microfiber inner provides absorption for small accidents. Pass-through tunnel allows you to add additional absorbency, such as a Super Undies Step-Up Insert. 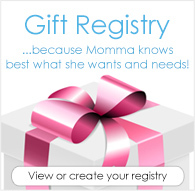 Available in 3 sizes and 5 fun colors. PLEASE NOTE: *Age ranges are approximate. Care Instructions: Turn inside out to launder. Shake solids into the toilet. Rinse on cold. Launder on warm or hot with your choice of detergent. Tumble dry. No bleach. No fabric softeners. Dry/unsoiled Super Undies may be washed with other laundry for your convenience. Solved our Daughter's Nighttime Issues! Our first daughter was potty trained during the day really well, but she was still in a diaper at night. We bought some of these trainers and used an insert we had on hand for additional absorbency. We really think being able to feel the wetness in these encouraged her to actually get up at night to potty instead of just using her diaper. Within two weeks of wearing these at night, she started waking up dry! If your child is a heavy wetter, they will definitely not replace a diaper. The sides will leak through if your child pees too much in them. They are great for small accidents though or to get your child just over the hump of night training if they're really close. They were very easy to pull up and down for my daughter too. My daughter is fully day trained and only wears pull-ups on long outings and at night. I got tired of buying pull-ups and purchased a couple pairs of these. They work great! I love that we can add extra absorabency as needed. She also is starting to get up sooner to use the bathroom in the morning now because she can feel the wetness against the skin. With sposies, she never felt wet, and never complained. I'm hoping these will help her be completely night trained soon! I did get a size medium for my 28lb 3 year old, and they seem a bit on the small side. I would recommend sizing up on these ones. The overnight ones seem true to size, if not a little bigger.